I am sure many of you remember me reviewing Diet-To-Go a couple times last year and hosting a couple giveaways with FREE meals from them. I bet some of you still drool when you think of the mouth watering, not-so-diet, diet meals. That is why I am so excited to share two wonderful promotions with you. The first is the incredible 1000 Meal Giveaway. There will be 50 lucky winners of fabulous Diet-To-Go prizes. Five(5) grand prize winners will receive a MONTH of free Diet-To-Go meals. Twenty(20) 2nd place winners will receive a free week of meals and 25 3rd place winners will receive a $50 Diet-To-Go gift card. The entry is so simple, it only takes 10 seconds. The contest will run January 1st through the 31st and winners will be selected on February 1st, 2014.Get all the details here. Any of those prizes would be fantastic, and perfect for helping you achieve your weight loss goals for 2014. Notice how I said goals and not resolutions. That is because of my second announcement. On January 7th at 9pm EST Diet-To-Go will be hosting a live, 1-hour Twitter Party: The Anti-New Year's Resolution. This is a real discussion about using common sense to achieve real changes and putting an end to unhealthy(and temporary) "quick fixes". In order to really be successful in weight loss, you need to do it correctly, and you will learn from experts and other people just like you at this fun, informative and rewarding Twitter party. With every tweet you will be entered to win one of the 4 amazing prizes. One winner will win their choice of a Fitbit Force Wristband or a Fitbit Scale. 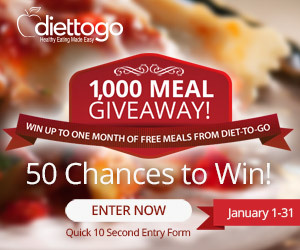 Three lucky winners will receive a free week of Diet-To-Go meals. Winning prizes just for taking part in a discussion that will help you reach your goals is a pretty great deal. I know I'm going to be tweeting my heart out. I want those meals. I really hope that you all will join me to learn and laugh together. Diet-To-Go Twitter parties are always a blast. you can find out more about the twitter party here. I wish you all a happy, healthy New Year. iCaught Santa And So Can You!